• Tap "Back up recovery image"
• Tap "Flash Cyanogen Recovery 1.4"
Seriously, that's it. Now your Android phone is splayed wide open, and ready for you to have your way with it. But, uh, what does that mean, exactly? Plenty of things! The biggest draw to rooting is the ability to install a new ROM—in other words, replace the operating system on your phone. There are two ways to go with this, both equally awesome. The first is to go with a super-customized community ROM. These are tweaked and enhanced versions of the phone's default software, often grafted with pieces of Google's forthcoming updates to Android, some near, some far, and all dessert-themed. Practically, this means multitouch—since the G1 and MyTouch already support this on the hardware side—app storage on SD cards, tethering, more home screens, new system keyboards, and perhaps most importantly, vastly improved performance. A lot of users say using one of these is a night-and-day difference, and given the kinds of things the HTC ROM community has done with Windows Mobile phones, I'm inclined to believe them. 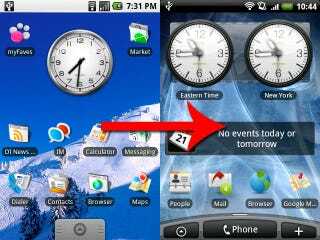 Your second path is to go full Hero—in other words, to install the HTC Hero's heavily customized OS, which is nothing short of fantastic, and about to get even better. This is a full phone conversion, and even in its current, slightly precarious state, well worth it. It&apos;s the Android phone we&apos;ve been waiting for. Almost. • Power off your phone. • Boot into recovery mode. Press and hold the Home key, then hit the power button. • Before you flash a rom file, perform a wipe. Press Alt+W to wipe the data and cache folders. You must wipe when going form different builds of Android. • Wait for the wipe to finish and the recovery image to display again, then select "apply any zip from sd". Flash the zip file of your choice. • After flashing any zip you should be able to reboot your system and watch it load to the home screen. You'll want to read their full rooting and flashing guide for caveats, but that easy little list there is about the size of it.